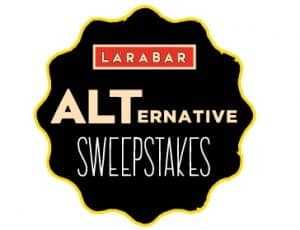 Click here to visit the Larabar site and fill out the form to enter their sweepstakes (their form is a bit hard to see, so you might have to change the brightness on your screen). There will be a total of 1,091 winners. You’ll have until February 28th to enter. Good luck! One (1) single speed bicycle. Fifteen (15) Upcycled tote bags with LÄRABAR ALT caddy and handmade pouch with four ALT bars. Twenty Five (25) LÄRABAR ALT 15-ct boxes. Thirty (30) Upcycled pouches with four LÄRABAR ALT bars. Twenty (20) $10 donations to American Forests. One Thousand (1,000) coupons for a free LÄRABAR bar.